It was an impressive weekend for defensive back Jalen Kimber. The four-star cornerback from Mansfield Legacy visited Texas on Saturday, won the fastest man competition at The Opening regional on Sunday and picked up an offer from Oklahoma later that day. The highlight came when he posted a 4.43 laser-timed 40-yard dash. That’s an impressive time for a player standing 6-1. Kimber is the No. 26-ranked player on the 2020 Fabulous 55. His national ranking isn’t as high with him checking in at No. 46 in the state, per the 247Sports composite rankings. That’ll change as his offers grow and he continues to showcase his athletic prowess. He’d rather not worry about rankings or testing numbers. He’s on a search for a new home after his prep career and a trip to Texas on Saturday gave the Longhorns a real shot at landing him. Kimber wants to commit by the start of his senior season. Kimber wants to narrow his list to five and set up official visits. He expects Texas to make the cut because of the impression left on him by assistant coach Jason Washington. The two spent 1-on-1 time together on Saturday watching film and discussing how he fits the mold of a Texas cornerback. Another DFW-based cornerback on Texas’ radar is Ryan Watts. 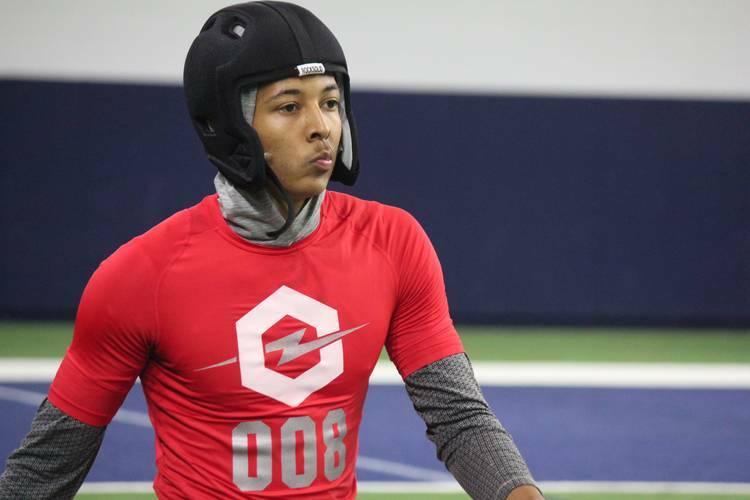 The 6-2 three-star from Little Elm was on campus for Texas’ junior day and spent the past two weekends impressing in coverage at camps held by Under Armour and Nike. He’s a long, athletic corner with massive potential. Watts wants to commit this summer and listed Oklahoma, Texas A&M, Notre Dame and Cal among his other favorite schools. He’s used the elite camps to improve and take stock of his current talents. Watts says he’ll pick a school based on the tradition of putting cornerbacks into the NFL as well as education and having a good relationship with the coaches. He even mentioned coaches’ contract lengths and the idea of choosing a school that knows the head coach isn’t in jeopardy of leaving before he graduates. Arlington athlete Jahari Rogers was another defensive back who made his way to Austin for junior day and took part in The Opening regional at The Star in Frisco on Sunday. The 6-foot three-star can play wide receiver or cornerback. Texas likes him on defense and Rogers enjoyed the message presented by the coaching staff on his trip. Hanging out with Washington was the highlight of his trip.